I’ve just come back to horseback riding. I started when I was 5 and now I get scared to jump. What can I do about it? Any fear you have, in any sport, can be overcome … you just have to take the proper steps. Horseback riding is a very dangerous sport and you have every right to be scared to jump on a horse. The reason why professional horseback riding jumpers are not scared to jump when they are performing is because they have years of practice and repetition. They are so comfortable jumping horses because they have done it so many times, and the fear has completely left their thoughts. 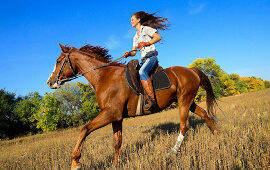 Start by just riding around on your horse without jumping. Practice all sorts of turns, going faster, slowing down… eventually you will feel so comfortable riding in all sorts of conditions, you will be confident to try new things… like jumping. When you are ready, don’t go for a big jump, but start with something small like a small log. Practice jumping over this log until you are ready to jump something higher. Eventually you will be able to jump over big jumps without having felt any fear, as long as you take your time and you never rush into anything that makes you scared. A lot of parents and coaches pressure children to try things they are not ready for. It’s important to talk to them and let them know that you are not ready. It’s very important that you don’t try anything that scares you… in any sport. A lot of accidents and injuries happen because athletes try things they are not ready for. Just take your time and practice over and over again, until you feel you’re ready to take on a new challenge!